The chocolatiest, moistest, most delicious, decadent brownies ever. 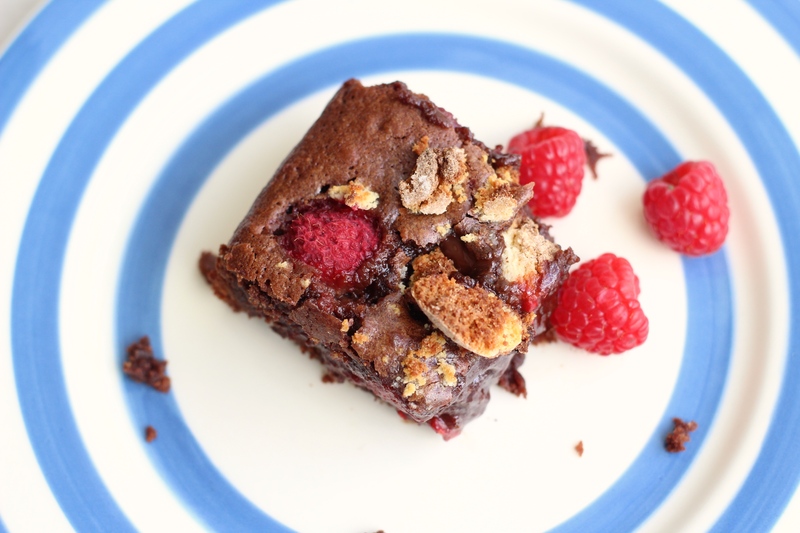 With fresh raspberries and crumbled amaretti biscuits, it takes the humble brownie to a whole new level of awesomeness. We went up to stay with my brother and his girlfriend, Meg, for the weekend in their new house. I asked if they had any baking requests, and Meg told me all about these brownies. 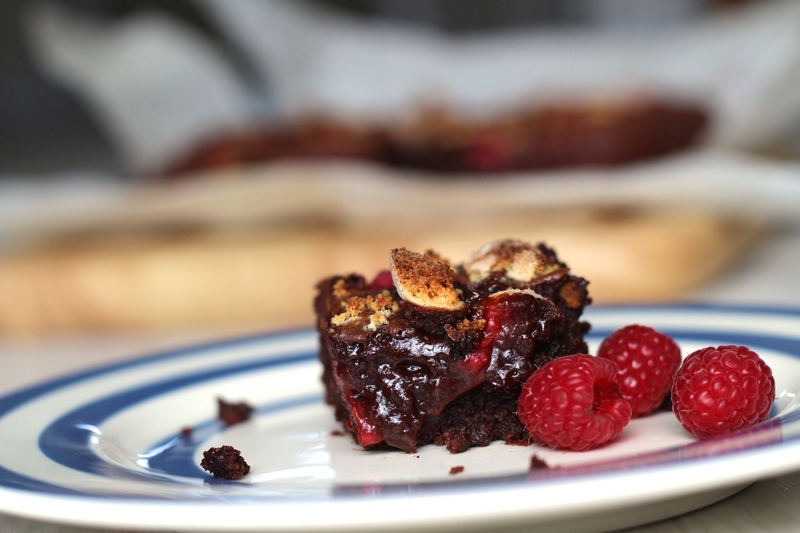 They originate from Jamie’s Italian, and Meg described them as the best brownie she had ever eaten. Well, challenge accepted! I know I said in my last brownie post that there was no need to ever look for another brownie recipe, but even the most brilliant people can admit when they were wrong! 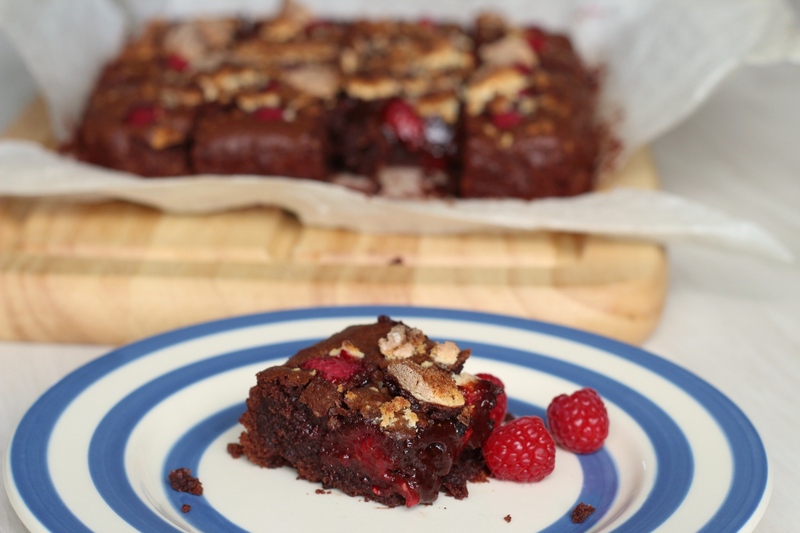 For a dessert brownie this recipe really is fantastic, as it is much gooey-er than my go to recipe. This is from a lot of melted chocolate in the mix, whereas my usual recipe relies on it’s chocolate hit from cocoa powder. This definitely makes them a lot richer, and makes them feel more dessert like. I’m pleased to say these rivalled Jamie O’s (or at least, Meg said they did – having never tried them myself I, of course, could not possibly comment!). And so, challenge accepted, challenge won! Makes 16 pieces, takes 25 minutes plus baking and cooling time. Line an 18cm x 18cm loose bottomed tin with grease proof paper and preheat the oven to 180 degrees. Melt the chocolate and butter together in a glass bowl suspended over a pot of simmering water – make sure the water does not touch the bowl. Break the amaretti biscuits with your hands into chunks. In a large bowl, whisk the eggs, sugar, vanilla, and salt together until thick and pale. When the chocolate has melted, whisk into the egg mixture. 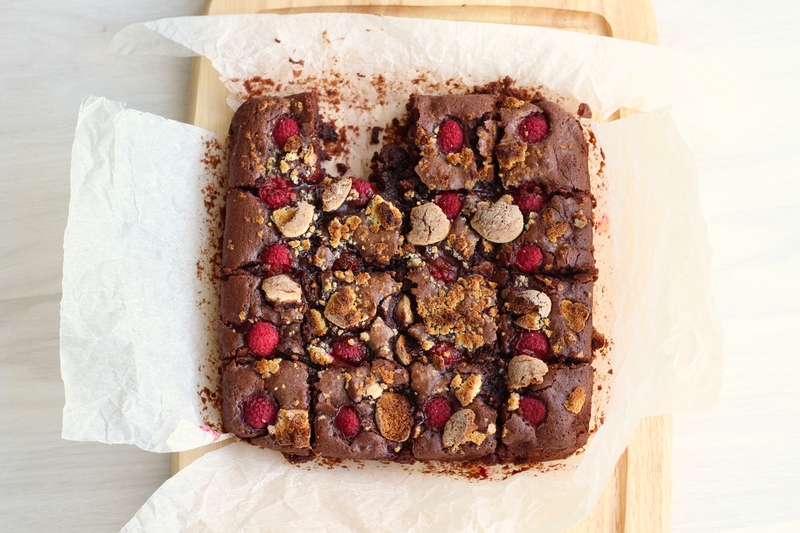 Fold the flour, chocolate chips, half the raspberries and a third of the crushed amaretti biscuits into the brownie mixture, then pour into the prepared brownie tin. 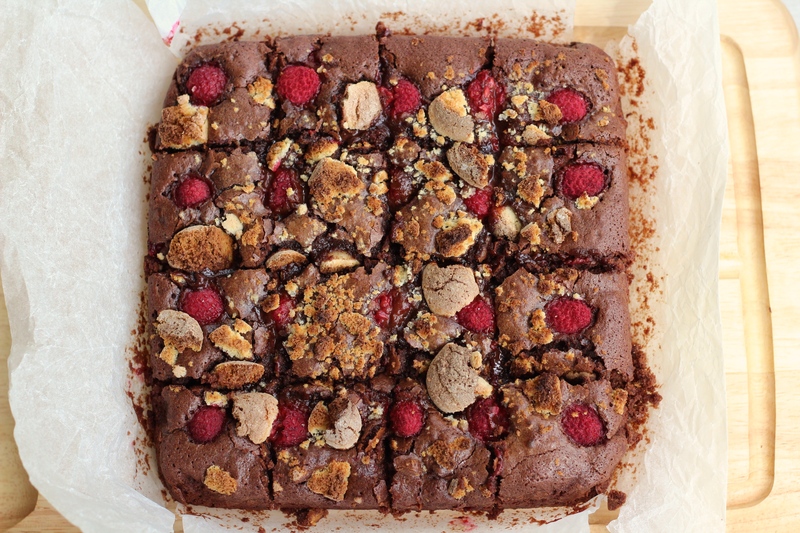 Stud your remaining raspberries into the top of the brownie mixture, so you can still see the pointy end, and then scatter over the remaining amaretti biscuits. Bake for 20 – 25 minutes. When ready the brownie will have a crusty top yet still wobble in the middle. Leave to cool in the tin for 20 minutes, then slice and serve. wow wow wow looks soooooo yum! !